Leading Manufacturer of slat chain conveyor from New Delhi. The Right Solution for Food, Packaging, Assembly, and Material Handling Designed specifically for food and packaging, machined components, material handling, and assembly automation applications, provide more options to handle virtually any material handling requirement simply, reliably, and affordably. 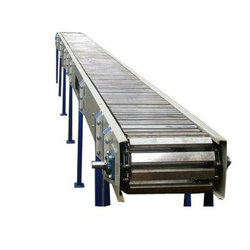 Looking for Slat Chain Conveyor ?